Eddy Gulch Grp. Current gold reserves est. at 900,000 oz's. Known as; THE RICHEST LITTLE RIVER IN THE U.S., the 12-mile section of the North Fork between Sawyer's Bar & the Forks of Salmon has kicked out billions of dollars in gold. Over 2M oz. 's of gold has been recovered from mining operations on the river alone. <<Uncle Sam 4,000 oz's. between 1860 to 1905.
sits right in the middle of it all. (general location. Not property boundaries). In the heart of some of the richest gold mining country in the U.S. Immediate neighboring notably rich mines in the area. 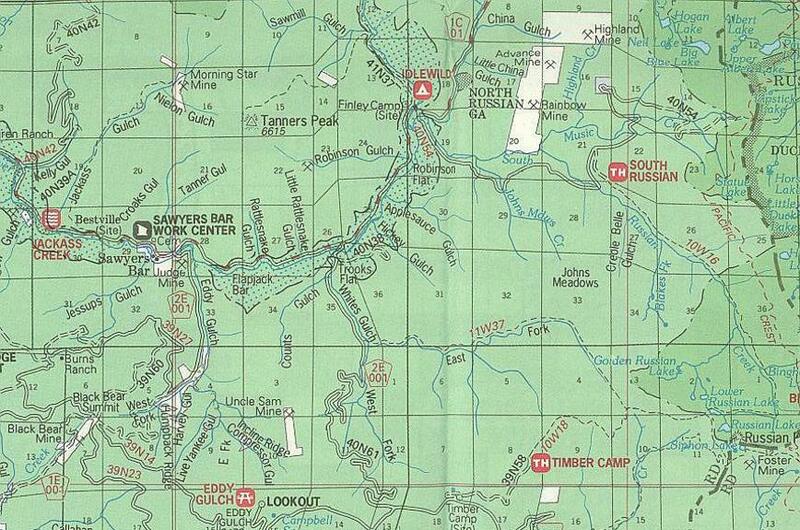 This remote 160-acres is clearly marked with brightly colored orange Federal Mining Claim Signs. Improved camping areas are available at Idlewild & LDMA campgrounds. "This District has similar potential for miles on strike to the east & west". Shown below is a brief snapshot of some of the reported billions in gold production history in this apprx.12x8-mile area. Production from these and numerous other mines in the district continued intermittently until the 1930s. Production was probably higher in many cases than shown. This map is far from complete.